An all new SWEET SUMMERTIME READS GIVEAWAY #3 is here! Hey y’all! 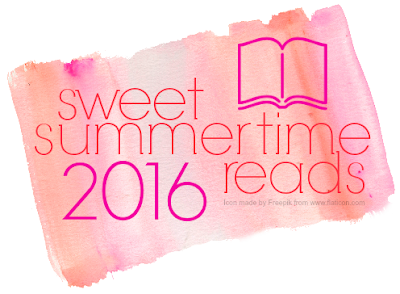 I am so excited to take part in Ginger’s Sweet Summertime Reads 2016! Ginger is such a good friend & I love that books & this community brought us together. I know how much Ginger loves summer and soaking up the pages of a good book, so when it came to making my selection of books to recommend, I thought of books that go perfectly with pool or beach days. I’ve always enjoyed summer. As a teacher, it’s meant more reading time and time to relax and recharge before the next school year. This summer has been different for me though. I haven’t been able to read nearly as much as I usually do and I most certainly haven’t been able to lounge by the pool without a care in the world. My summer has been spent sitting on the floor playing with my 6 month old daughter, drowning in piles of laundry, and soaking my hands in the sink while washing bottles. Quite the difference to what I am used to when summertime comes to mind. However, I’ve managed to sneak in some reading time when the baby is napping or staying up way after bedtime just so I can take a vacation between the pages of a good book. Lies and Other Acts of Love by Kristy Woodson Harvey -- As a southern girl, I just love how this author and dear friend captures the essence of family, despite all of the lies and secrets one may have. This story is beautifully written with dual points of view and something you can easily read in a weekend at the beach or poolside. The Loose Ends List by Carrie Firestone -- While this book can be heavy, I can’t express just how much I enjoyed it and the unique summer adventure one family has while dealing with the impending loss of a beloved family member. This book will tug on your heartstrings, but leave you anxious to live life to the fullest. The Moon & More by Sarah Dessen -- Whether you’re enjoying your summer before the adventure of college begins or you're well outside of those college years, this Sarah Dessen novel is perfect for chasing your dreams while catching some sun. Thank you Heather for these "sweet" reading recommendations. And I agree with her that a Dessen read is pretty much the perfect summer read. I have yet to read the others she's listed, but definitely adding them to my TBR. What about you, have you read any of these?